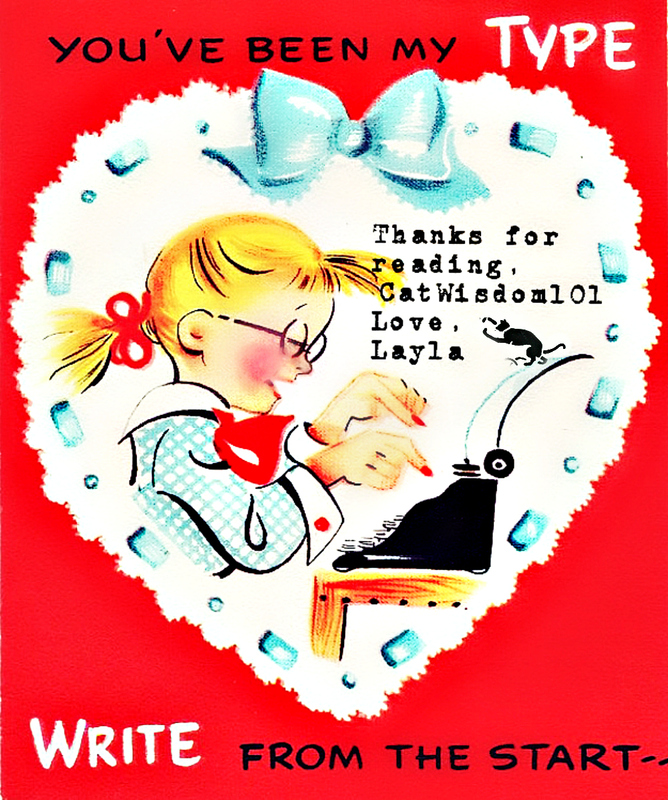 Valentines For Writers and Is Your Cat Your Valentine? Updated for Valentine’s Day! You are loved by us. It’s February the month of love aka cat love. From our Black Cats Tell All 2018 Calendar are the lovely cover girl meowdels. From Spain, Lili @Neko_and_lili are about to celebrate 30K on Instagram and deserve a shout out for being so fun and supportive. 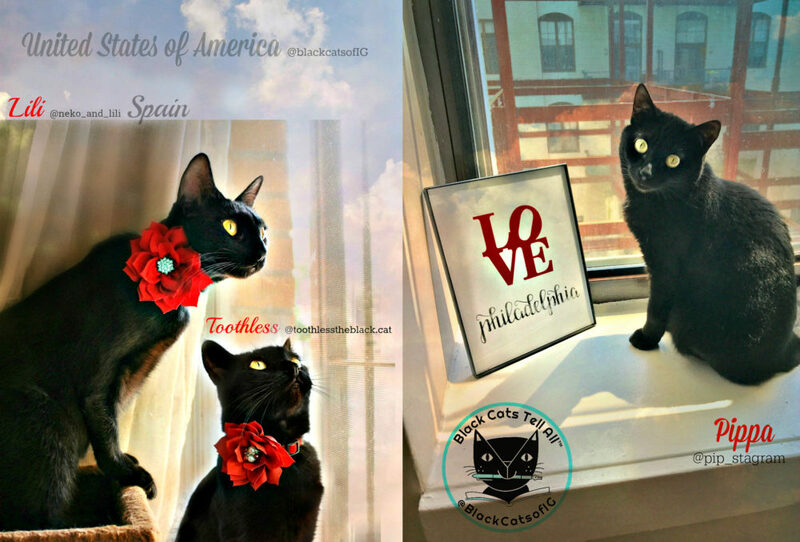 Ditto, Toothless, the equally gorgeous pantherette @toothlesstheblack.cat from California and dear member of our http://www.instagram.com/BlackcatsofIG community. Pippa @pipp_stagram from Philadelphia is newer to Instagram but 100% adorable. Check them all out if you love black cats. 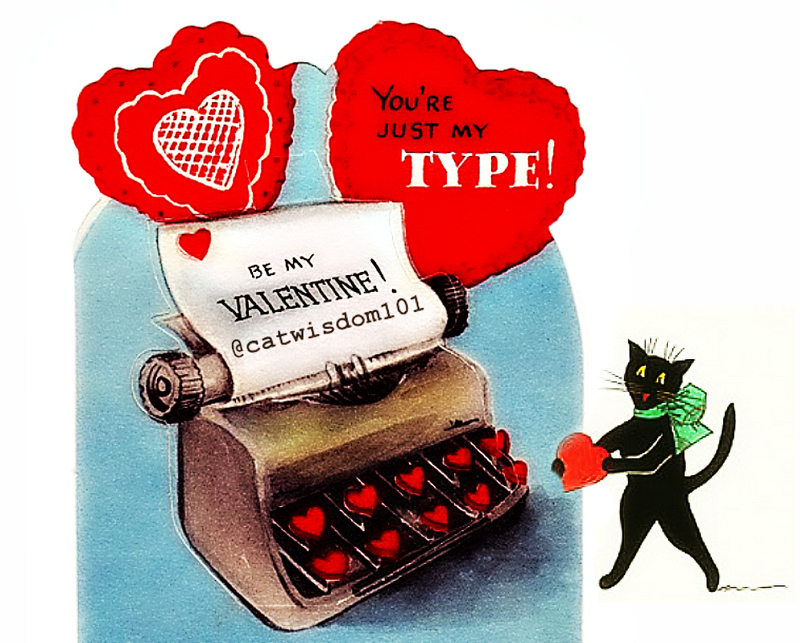 My cats aren’t going on Valentine dates like previous years And if you love vintage cards we have lots in our archives like 100 years of Valentines with cats. Clyde knows I’m his Valentine (even though I’m married), and wants to know is your cat your Valentine? When I was a kid growing up in Montreal, Canada we exchanged Valentines. Things weren’t are egalitarian as it is now. There were no rules or fair play. The popular kids got more Valentines and the shy, weird or different kids got less. All the cards were placed in a big box and as we sat at our desks monitors handed them out the red badges of love and caring. The excitement and anxiety mounted or in my case, fear. I glanced from side to side, wondering why I had so few. My feelings of self-worth evaporated into a stew of humiliation and despair. I didn’t know I was an INFJ or had a high IQ. All I knew was I wasn’t accepted. One year I got no Valentines. As a flurry of red paper hearts and laughter surrounded me, my desk remained a brown island. Zero love but plenty of tears and self-loathing. 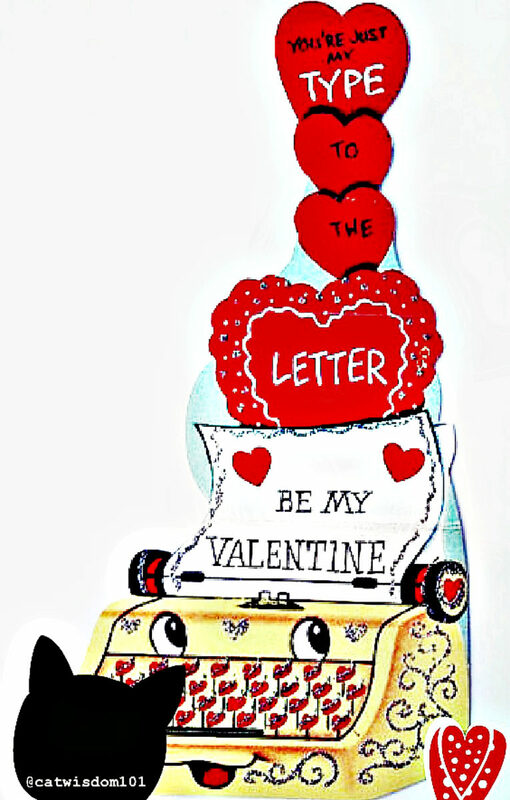 Many years of therapy later, I love vintage Valentine’s Day cards and adore sharing the love. 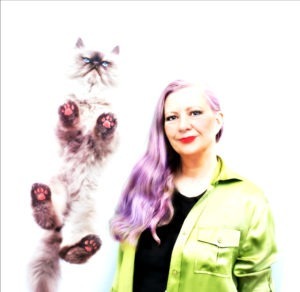 It’s no accident that cats and writers go together like… you fill in the blanks. 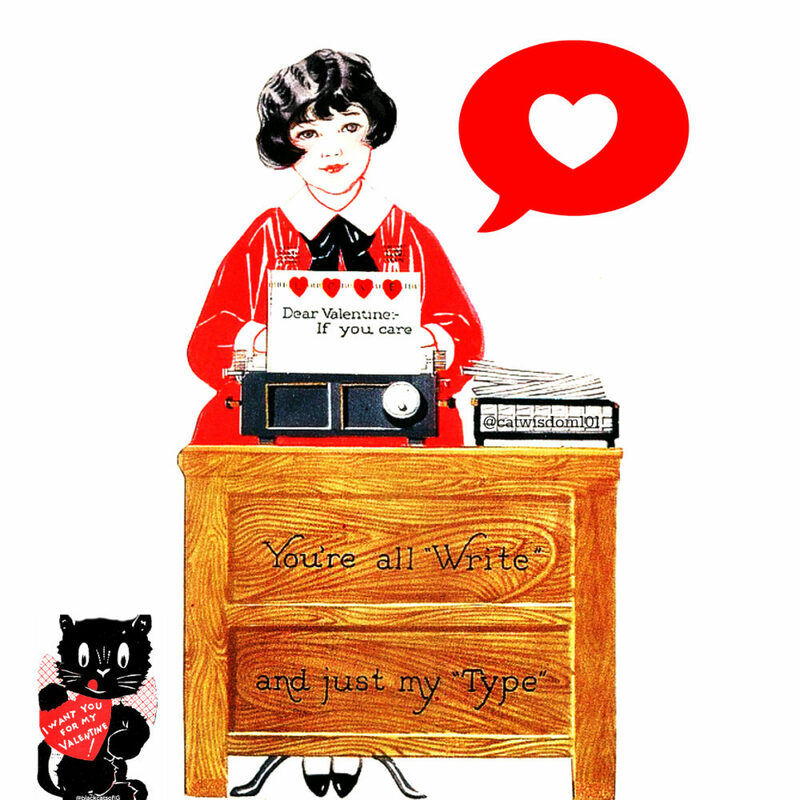 Here are a few, newly revised vintage style cards with a typewriter theme. I also created a card you can use with your own photo. 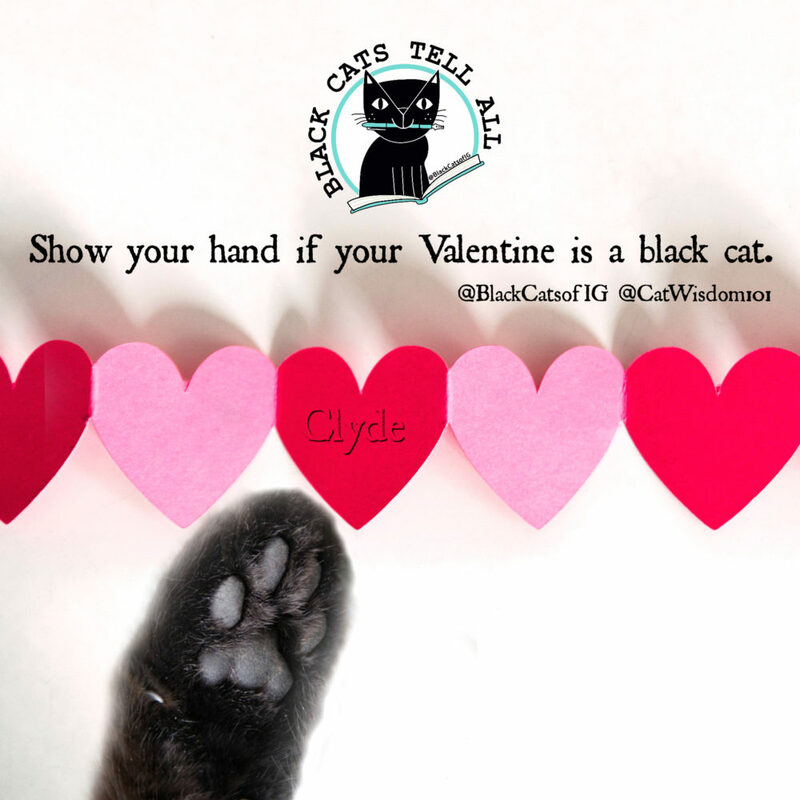 We have been posting lots of other kitty Valentines on Instagram stories at all three accounts, and a mix on Pinterest, Facebook and Twitter. We will post a few more IG stories for V Day and sending lots of love to you and your kitties. 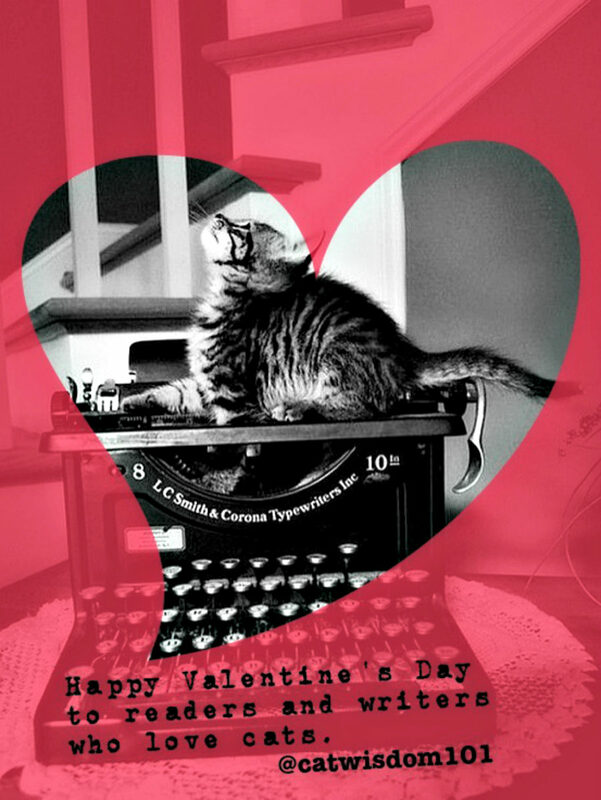 Who is your feline Valentine? Are they getting a gift or treat? Oh – I love these vintage cards! But, ugh, I remember how horrible Valentine’s Day was in school and wondering how many cards you were going to get. So cruel. Those are so awesome, Layla and Clyde. Happy Valentine’s Day, sweet pals! 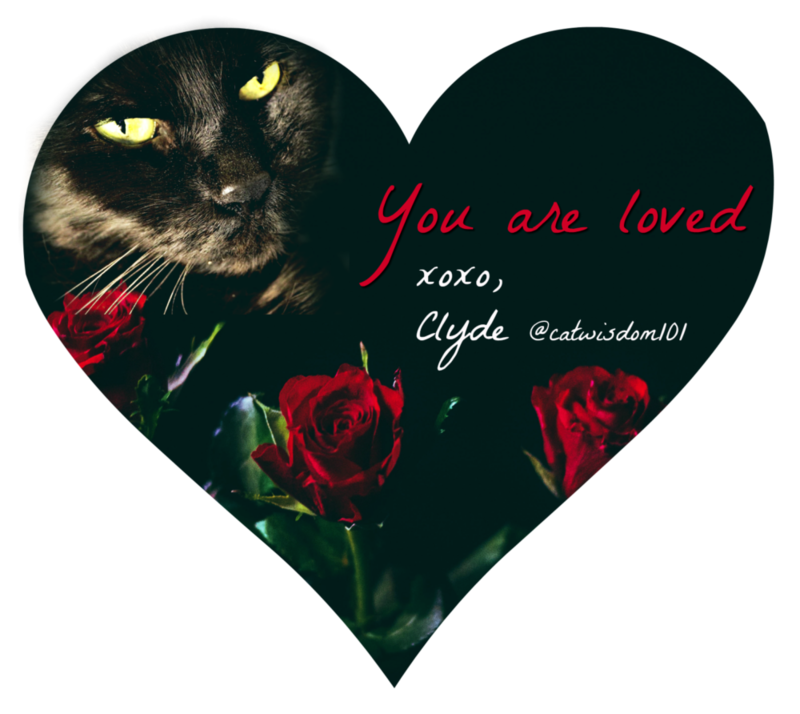 Your Valentines cards are amazing but the one that melted my heart for the final one of Clyde. My human says that when she was a kid, you taped a brown bag on the back of your chair on Valentine’s Day, and the kids put their Valentines in the bag. That way it was easier to hide when you didn’t get a lot. I always have a cat as a Valentine. I remember the sadness of not getting any valentines, too. Even worse, I remember when I was about 11, finding 2 valentines in my desk from the 2 most unpopular boys in the class. That’s all I got. I felt bad then, but I feel worse, now, because I never thanked them. How must they have felt when I ignored their kindness? 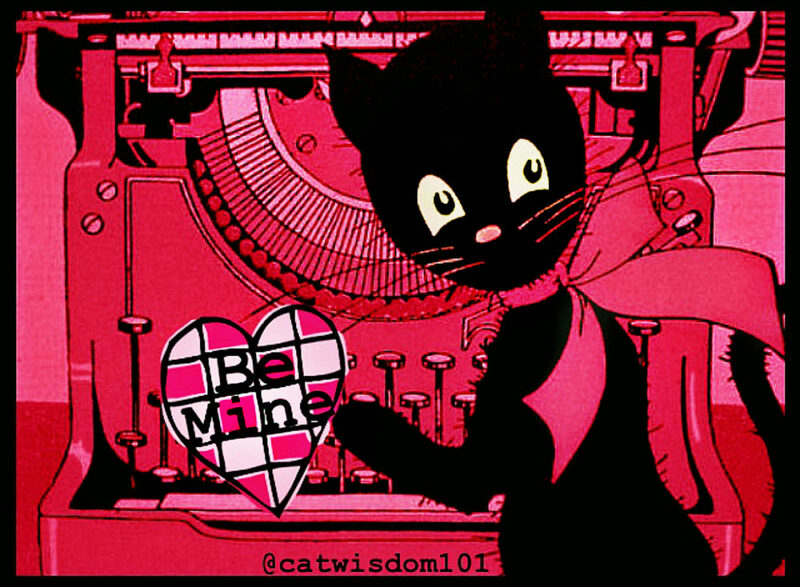 I do have a human valentine, today, but I always cherish my cat valentines because they were always there when I had no other. 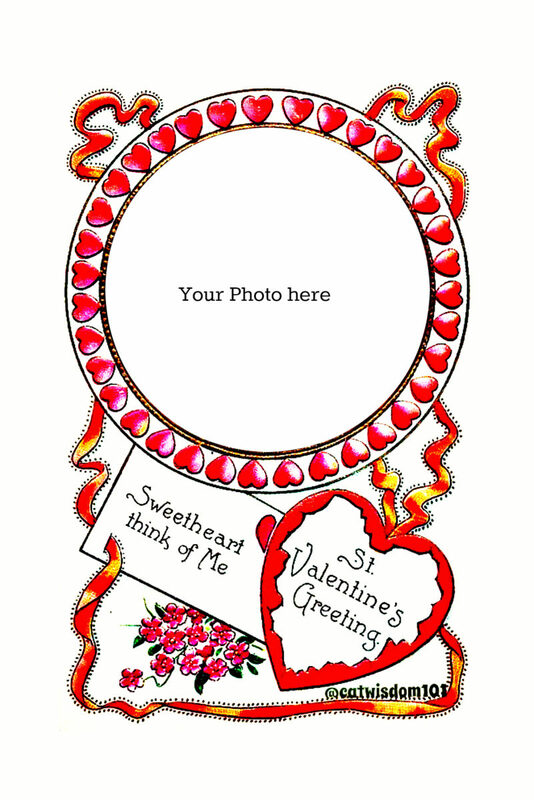 Judith, thanks so for sharing about your Valentine memories. I wasn’t sure who would relate to it but even one was worth it! Those two boys probably grew up to be something special. It made be wonder about other gender distinctions too. Last year, I created a Valentine’s note for The Hubby, using photos of Chuck and Angel. He’s asked for another note this year, with Angel, Manny and Chili Bruce. What a great idea. Lucky hubby!